5 miles a week=a 20% decrease in mortality chances. 10 miles a week=a 31% decrease. 15 miles a week=37% decrease. Up to 50 miles a week=39% decrease. Over 50 miles a week=31% decrease. Clearly any sensible person will avoid running over 50 miles per week, right? For me it will be 49.9 miles and not one step farther! But seriously, do people who run in excess of 50 miles a week do it just to prolong their lives? Since I’m interested in the stewardship of the Christian body, it occurred to me that a bit of math might be possible. 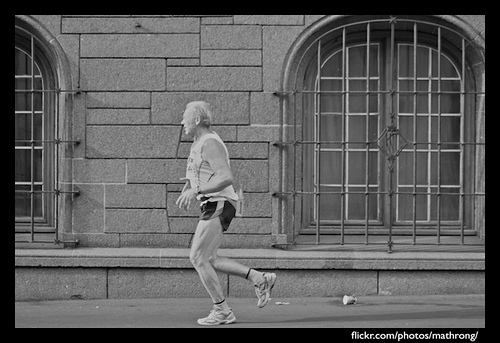 Let’s assume that our runner is doing 8-minute miles and that the reduction in mortality adds years to your life. For the purposes of my decidedly non-scientific study, I’ve assumed that average life expectancy is 80 years and that a 20% reduction in mortality adds 2 years to that. A 31% reduction thus adds 3.1 years and so forth. How did I arrive at those numbers? Honestly, I just plucked them out of the air, but humor me. If you run 5 miles a week at 8 minutes a mile, you’ll spend just under 35 hours running each year. If that 20% reduction in mortality gains you 2 additional years of life, you’ll gain 17,520 hours of life minus 70 hours of running for a net gain of 17,450 hours or 1.99 years. Running 35 miles a week, right in the middle of that optimal range, you’d spend a whopping 242 hours a year on the road, but your 39% reduction in mortality would earn you an additional 3.79 years of life. Some very attentive reader will note that I have not accounted for the hours that must be run between now and when you hit your “extra time” over 80. So let’s assume that our light runner is 20 years old. Those 35 hours a year over 60 years will mount up to 2,100 hours or roughly 3 months. The net gain is still considerable. Granted, my math is vaporous stuff but the basic premise is sound. When we invest our time in exercise–running or swimming or whatever–we’ll not just spend time. We’ll gain an increase of time on this earth. That’s time for mission trips, family events, community service, or just to make your retirement providers pay out more. Even if exercise does not reduce stress, improve self-image, or anything else positive, the longevity issue ought to seal the deal. Exercise, the numbers insist, is good stewardship. Prev Dear Fitbit: Am I Sleeping?